How is your organisation coping with GDPR since the 25 May 2018? The General Data Protection Regulation (GDPR) finally took effect at the end of May across the EU. Many organisations are still struggling with the amount of changes and work required. 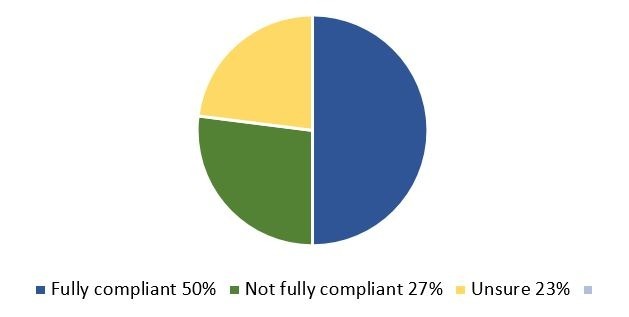 A recent survey carried out by the UK branch of the Institute of Chartered Secretaries and Administrators (ICSA) revealed that only half of those interviewed were ‘fully compliant’ on the enforcement date of 25 May, with roughly a quarter (27%) not fully compliant and the rest (23%) unsure. One suspects that a similar response would be found in Ireland if such a survey were conducted here. • A lot of training and awareness was needed to decrease anxiety among staff who feared doing something wrong. To hear more about the ongoing requirements of the GDPR, come to our next CPD course, GDPR for Accountants on Tuesday 25 September 2018 in the Talbot Hotel Stillorgan, Dublin, at 9:30am. All delegates will receive a GDPR get started checklist, the GDPR law itself, along with other support materials. Watch for our forthcoming GDPR Data Protection Procedures Manual coming soon.